The Rocketvac Back Pack. The mainstay back pack of the Australian and New Zealand Cleaning industry for the past 10 years. A trusted product and brand that you have come to rely on. Well ,it has just got better. You can choose to stick with this trusted product because it's what you know and trust or you may want to sneak a peak at the product page of the our new Rocket Vac XP. (XP) for Xtra Performance. Tested in the market for the best part of 2009, the Rocket Vac XP was officialy released at the Industry trade show Cleanscene in October 2009. So now you have 3 choices, The Rocket Vac, Rocket Vac XP and Shadow Vac, take your pick. The Rocket Vac uses a quiet, flow-thru motor, protected with an auto, reset thermostat in case of accidental blockage. 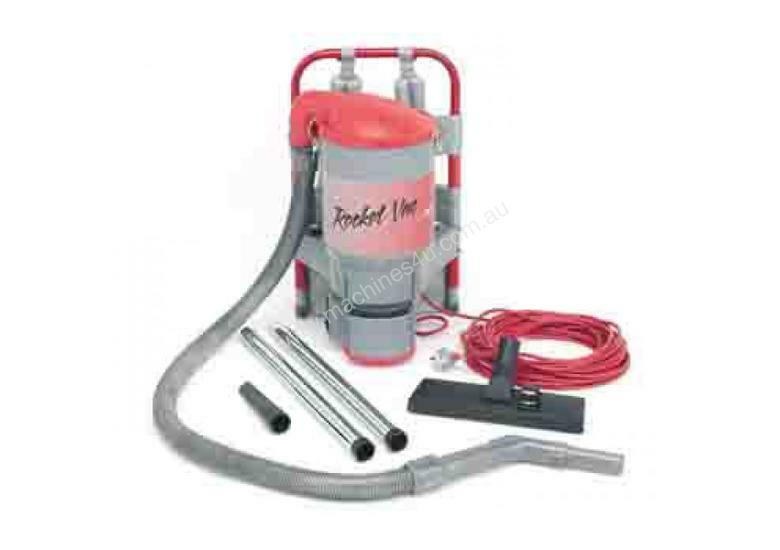 The Rocket Vac is fitted with a powerhead outlet to operate a "Powerhead." The motorised powerhead is designed to convert the Rocket Vac to a super-fast, super-effective upright vacuum cleaner for cleaning deep pile carpet, carpet prone to heavy linting or traffic. This twin motor system gives high performance without weight. Full set of commercial quality tools including chrome steel wands for longer wear. 1.2 metres commercial quality hose. Comfortable hand piece. Lightweight, comfortable frame - safe weight distribution. Snap-adjust buckles for correct fit. Top fill dust bag. Maximum capacity is 4.0 litres. Fitted with secondary filter and after filter. •Powerful high airflow 2 stage, 1000 watt Flow Thru motor. •Manufactured from light weight yet robust ABS plastic, with integral moulded cord restrainer and tool holder. •Ergonomically designed light weight frame, and adjustable straps for even greater operator comfort. •Triple filtration to ensure quality cleaning. •18m, 10amp electrical power cord. •Overheating auto reset thermostat fitted in case of blockage.